The RMIT Master of Fine Arts Graduate Exhibition opens this Wednesday 30 November from 5:30-7:30pm at Gossard Project Space, RMIT Building 49, 67 Franklin Street Melbourne. Graduating gold and silversmithing MFA students are Claire O'Halloran, Mary Hackett and Leah Teschendorff. Congratulations to all the graduates! 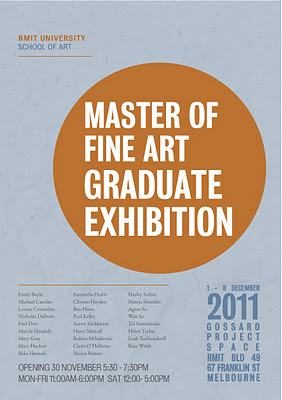 The exhibition runs until 8 December.